Robbin and Steven hadn’t considered adopting two children. But when Rachel, a Wendy’s Wonderful Kids Recruiter, told them about Dawson and Dalton, they knew they had to keep the boys together. Today, the brothers are thriving together in their home. Dawson is doing well in school, Dalton’s health has markedly improved (he has both epilepsy and cerebral palsy) and the boys’ laughter fills the house. 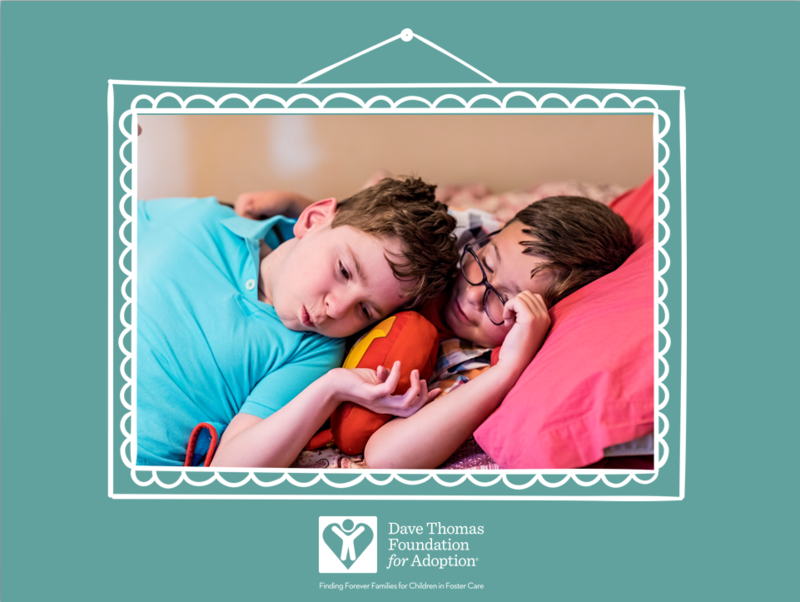 The Dave Thomas Foundation for Adoption believes that siblings in foster care deserve the chance to stay together. Through the Wendy’s Wonderful Kids program, adoption recruiters work tirelessly to keep siblings together whenever possible. Today there are 110,000 children, who unlike Dawson and Dalton, are still waiting in foster care to be adopted. Your support can help to find loving, permanent homes for each one. Click here to make your tax deductible gift today.